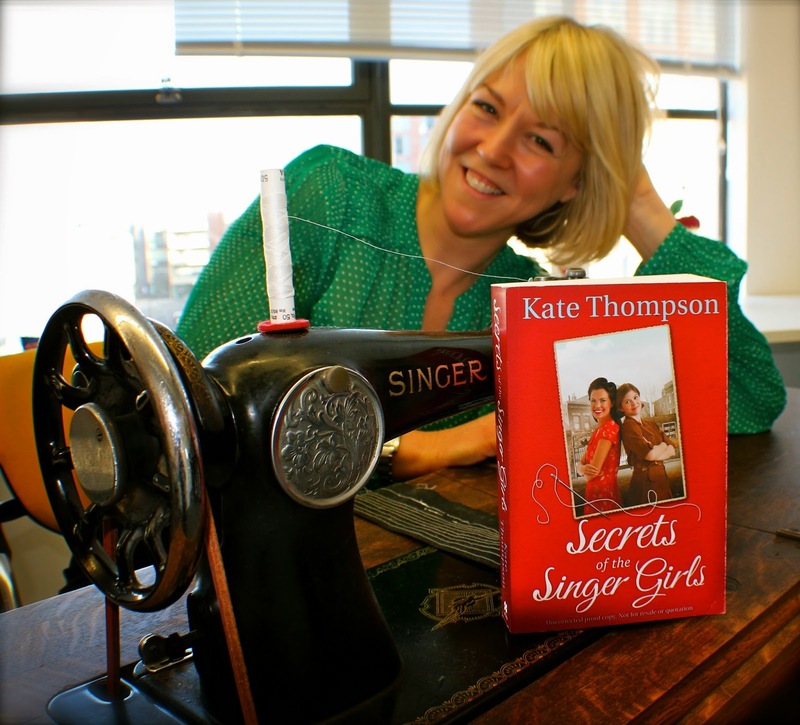 My guest today is Kate Thompson who tells us the fascinating story of a woman with whom she shares her name. 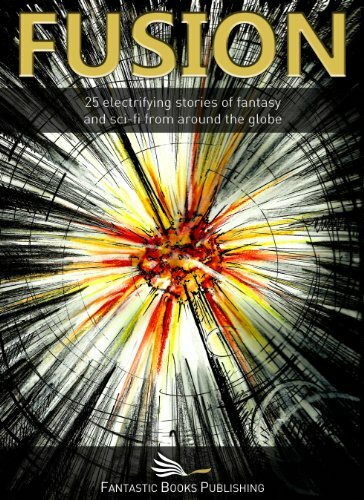 I was gripped when I read it, as I am sure you will be. 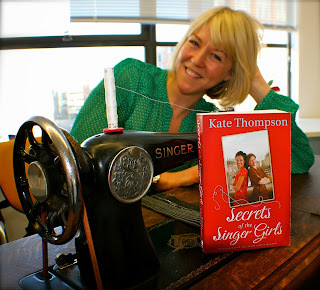 Kate’s first novel, Secrets of the Singer Girls, is a nostalgic wartime saga set in an East End garment factory and was published in March by Pan Macmillan. For fifteen years, Kate worked as a journalist for national newspapers and magazines like the Daily Express and IPC’s true-life weekly Pick Me Up, before going freelance four years ago. 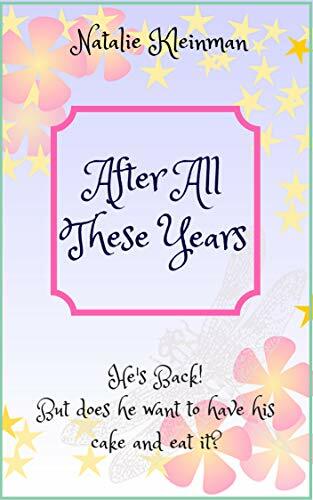 She now combines freelance journalism with writing and is currently working on a prequel to Secrets of the Singer Girls, provisionally entitled, Secrets of the Sewing Bee. Kate lives in Twickenham, Greater London, with her husband, two boisterous, energetic young boys and an escape-artist miniature Jack Russell called Twinkle. 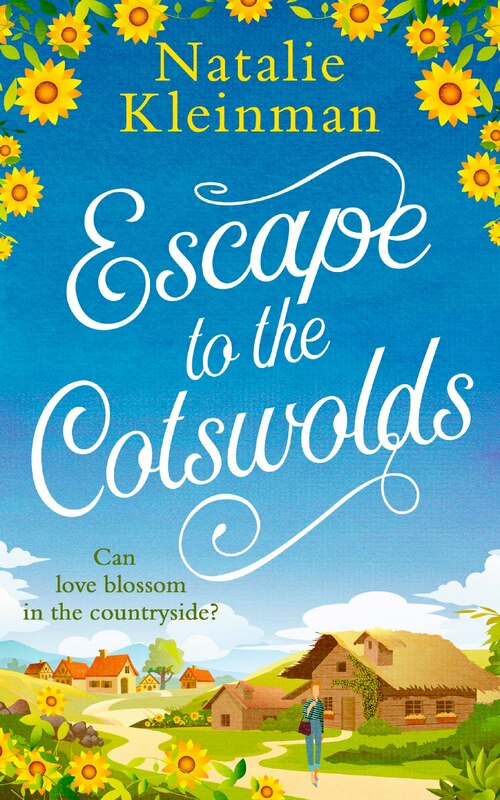 When she’s not chasing after her sons or Twinkle, she is to be found locked in the office at the end of the garden trying to write, on research trips in London’s East End, or slumped on the settee with a glass of red wine. 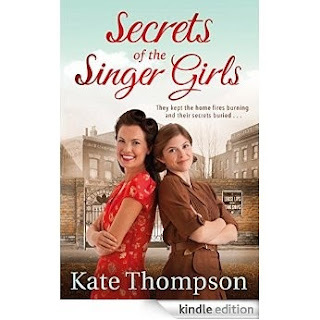 Here is a piece Kate has written about the inspiration behind Secrets of the Singer Girls. The chilling moment I discovered I was a victim of a wartime tragedy! Staring down the stairway that leads into London’s Bethnal Green Tube Station, I found myself about to be taken on a journey back in time. On a spring day with streams of commuters descending the stairs, nothing could look more ordinary, but seventy-two years ago, tragedy unfolded on those steps. Little is known of the biggest civilian disaster of the Second World War, but in less than 30 seconds, 173 people, were crushed to death on the stairway that led down to what was then an underground shelter. Not a single German bomb was dropped but, in the time it took for the air raid siren to sound, the narrow corridor was converted into a charnel house as a horrifying crush of people piled helplessly one on top of another. After the searchlights went on, an anti-aircraft battery in nearby Victoria Park launched a salvo of new rockets and, fearing a bomb, the crowd surged forward. A mother carrying a baby tripped on the stairs and, like a pack of cards, the shelterers fell, one by one. The scenes were unimaginable on that bleak March night in 1943. My reason for wanting to visit the sight where so many people died wasn’t born out of morbid curiosity, however. I was there to research it as I had already decided to feature the Tube disaster in the novel I was writing. Set in the East End of London, Secrets of the Singer Girls attempts to unravel the mysteries that bind four machinists who work sewing Navy and Army uniforms for the troops. The research I had already conducted revealed a world of poverty, grim survival, immense bravery and human tragedy in wartime Bethnal Green. But it was discovering that I shared a name with a victim who died in the disaster which leant a deep poignancy to my research. Just who was the other Kate Thompson, and what led her to flee to the so-called sanctuary of the underground that fateful day? Cursory research did not bode well. Kate was at the Black Horse pub in her favourite fur-collared coat when the sirens went off. She was a 63-year-old mother of nine, living in one of Bethnal Green’s roughest areas, when she perished. It would be easy to dismiss Kate as a victim battling for survival but to do so would be foolish. A closer examination into her life revealed some surprising results. Kate Hammersley was born in September 1880 in Poplar, East London. At the age of 18, she married William Thompson, and moved to Bethnal Green, where she bore him seven sons and two daughters. They resided at Quinn Square in Russia Lane. Pre-war, Bethnal Green housed some of the worst slums in London and, of them, one of the most notorious was Quinn Square, a place where locals say you never went after dark and policemen only dared visit in pairs. Some of the flats contained illegal gambling dens and when the police were about, quick-witted residents would whistle off the balconies. None of the flats had their own water taps or toilets, and tenants shared facilities on the landing between four families. Washhouse facilities were housed on the roof, and the women of the Square had to drag their laundry up six flights. According to one local resident, the stench from the toilets was unholy. Perhaps that’s why Russia Lane had its own bathing centre, known as a Personal Cleansing Station. So far, so depressing. By August 1938, Kate Thompson and many others lived in a squalid, dilapidated hellhole. Residents reported broken steps, lavatory doors with no locks and broken facilities in the washhouse. Not only that, but the landlords were having a merry time at their expense, charging exorbitant rents for such miserly facilities. How did the feisty women of Quinn Square put up with this? The answer is, they didn’t. According to the electoral register, Kate was registered to vote from as early as 1923. Perhaps it was this interest in politics that lead Kate to insist on her right to a decent standard of living. Far from being a dormant victim, Kate and the other residents promptly formed a Tenants Association and flatly refused to pay their rents until the rapacious landlords reduced them to more reasonable levels. One landlord responded by attempting to evict a tenant. When the agent arrived on eviction day, the tenants, wielding placards and chanting, ‘Less Rent, More Repairs’, barred their way and the landlord was forced to beat a hasty retreat. The biggest rent strike ever seen in the East End sent the press wild. Buoyed by their success, the tenants of Quinn Square paraded around Bethnal Green with their placards and picketed the estate office. Apparently, every time the landlord went into the Square – on one occasion even accompanied by a group of Sir Oswald Mosley’s fascists, who attempted to break up the tenants meeting by organised hooliganism – a huge crowd of women followed them and booed them out of Russia Lane, pelting them with hot potatoes. And so it was that Kate and her neighbours scored a resounding victory for the working-class underdogs of Quinn Square. It would take more than an unscrupulous landlord and some bullyboy fascists to scare them into submission. The landlords acceded to their demands to lower the rent and carry out repairs, and the test case for arrears of rent made history, paving the way for success for other Tenants Associations. 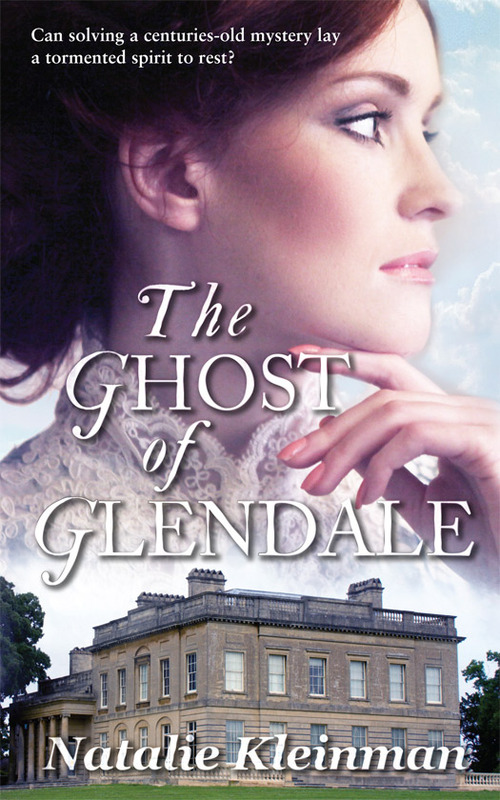 A year later, war broke out, and Kate began the second great fight of her life. Quinn Square was demolished in the 1960s, but I believe Kate’s legacy remains today. It proves that you should never underestimate the fighting power of a woman when her home and her family are under threat – 1938 or 2015, it matters not, a mother will fight tooth and nail to protect the roof over her children’s heads. The other Kate wasn’t afraid to stand up to corrupt landlords and fascists marching on her street. My 1940s namesake was a far stronger, finer lady than I. Indeed, it would appear that a love of a fur collar is about all we have in common. I wish I had one ounce of her courage and pluck. Thank you for featuring me on your blog, Natalie.